Tempest Map for Mass Effect Andromeda Video Game. 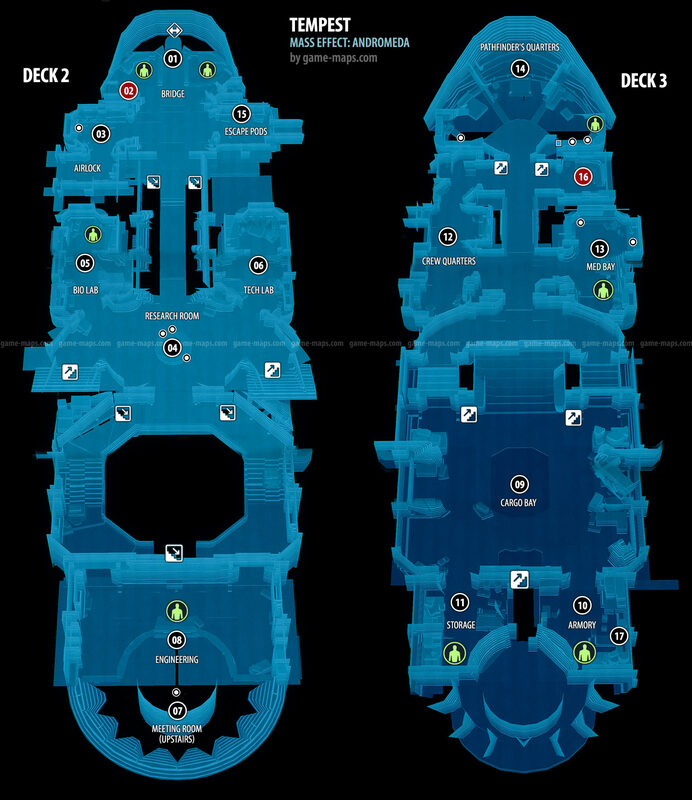 Atlas with Maps, Game Guide and Walkthrough. Map contains Quest starters, interesting locations, Codex Entries. The Tempest is a Survey ship designed for long-range, long-term exploration under a Pathfinder's Command. Its lightweight and efficient design allow it to operate with a Small Crew and minimal resources. The Tempest's engine is a variation on the arks ODSY drives that allow long-term Operation, Capturing a percentage of the static buildup in capacitors. The recycled electrical charge powers several of the Tempest's onboard systems. If the Tempest is docked on Nexus and you want to exit, select Galaxy Map and then Docking Bay. Professor Herik from the Nexus tech labs has asked you to make a home for a young pyjak aboard the Tempest. Loadout Station Here you can choose your equipment and squadmates before embaring on a mission. Special Delivery Cache here you will receive items from special version of your game. Dr. Aridana has attempted to contact you. Speak to her at Nexus tech labs. By all accounts, William Spender is a difficult man. But there is reason to suspect that the Assistant Director of Colonial Affairs is actively working to undermine the krogan. Drack has asked you to investigate Spender's activities. After making initial contact with the angara, you must now gain their trust in order to meet the Moshae and access the vault on Aya. Either Voeld Or Havarl would be likely places to start. First go to Havarl then go to Voeld. Liam suggest the crew would enjoy a relaxing movie night. An asari survey ship, the Periphona, may help you find the asari ark itself. Use the Periphona's transponder codes to track the ship from her last known location. Email from Peebee or talk to Peebee. Collect the rem-tech Peebee needs. While gaining Evfra's trust, you have garnered the attention of the Roekaar, a cell of angaran fighters who hate all aliens. Jaal has information about the roekaar's leader, AkkSul. You pushed the Roekaar Out of Site 1 and AkkSul has left Eos. After the Roekaar's failed attack On Prodromos, Jaal received a message from AkkSul. Read email from Cora for Cora Harper: Asari Ark, then go and talk to her. By activating Havarl's lost monolith and resetting the vault, you prevented the planet's destruction. Angaran scientists at the Pelaav research station expressed an interest in working with initiative teams. Director Addison dispatched several researchers to the planet, and has asked you to check in on the situation there. Liam wants a small armor project approved, calling it a diplomatic effort with Jaal. Complete the research project to secure what he needs. Access the Development Screen at the Research Center, under the Special category. Acquire components through exploration, or from merchants on the Nexus. Talk to Liam in his room on the Tempest. Talk to all team members on Tempest. You will got yhis quest after you meet Peebee at her Nexus Apartment. There are reports of interesting and potentially lucrative activity in the Remaw system. While those reports alone seem vague, it's also the area that the turian ark may have been headed. 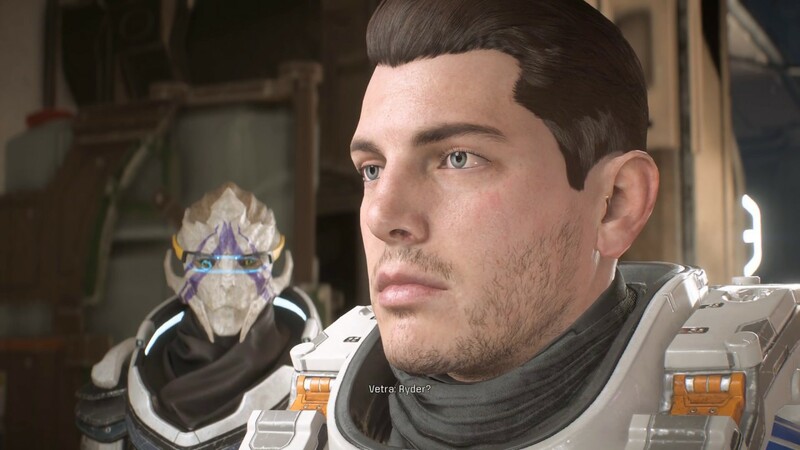 Vetra and Peebee suggest that we check it out. Travel to H-047c in the Remav system. Drack is concerned about tensions at the krogan colony on Elaaden. He's forwarded you an email from Jorgal Strux, a well respected krogan from an old family. Strux has asked to meet you at a trading post called Paradise. He's also asked that you keep it a secret. Vetra's sister. Sid, is waiting for a call from you and Vetra. Check email for Jaal Ama Darav: Friend of Foe? Reyes Vidal has sent an email asking you to contact him via comms. Avitus Rix believes that Macen Barro, the turian Pathfinder, is still alive. He has recruited you to help find him. Director Tann reports that the angara have opened an embassy on Aya. Check in with the Initiative's representatives there to make sure things go smoothly. Email for The Firefighters go to the hackers' sanctuary on Kadara. An Initiative citizen with an incurable disease has been awakened from stasis. Track her down and return her to stasis before the disease spreads. You've received an email from Sid, Vetra's sister, who thinks she has uncovered something suspicious going on at the Nexus. It does not matter if you choose Addison or Sid side on the end of this story. In both cases nothing bad will happen. Email from Keri for Task: Path of a Hero, speak with Keri about Kadara. Talk to Suvi on Tempest. Find a plant on Aya for Suvi. Liam thinks it's time for something "familiar" like a day out on aya. He also mentioned "getting your eyes on something" but wasn't specific about what he meant. Evidence suggests a creature has been eating the Tempest's food stores. Search the ship to find it. Find rare Remnant tech so Peebee can perfect her scanner. Access the vidcon on the Tempest for Jaal Ama Darav: Friend or Foe? 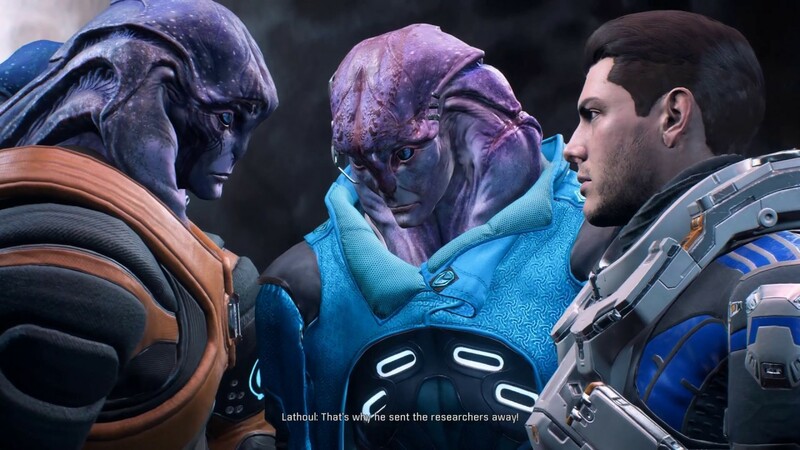 Liam is pointing your efforts toward his friend and fellow squadmate, Jaal. Placing outposts and dealing with Calot made Andromeda more stable for the Initiative, but it'll be hard to make Heleus a home if the angarian Resistance falls into turmoil. Check email for Jaal Ama Darv: Freind or Foe? Play Akksul's video message in the meeting room for Jaal Ama Darv: Freind or Foe? Dr. Kennedy is due to give birth Soon. The first human born in Andromeda would be of genetic interest to the kett, and a symbolic target for the Roekaar. Drack wants to have a drink or ten at his favorite bar in Kadara Port. A night on that kind of town with this kind of krogan Could get interesting. Scan rooms on Tempest for anomalies. Liam has arranged something special on Eos "for everyone". Travel with him to meet spot near Prodromos. The Archon's map shows the way to Meridian. 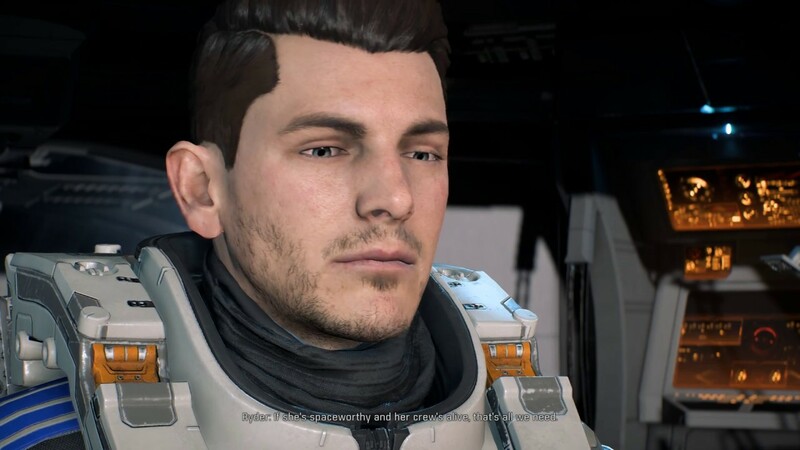 However, this issue affects the entire Andromeda initiative, and leadership should be consulted before proceeding further. 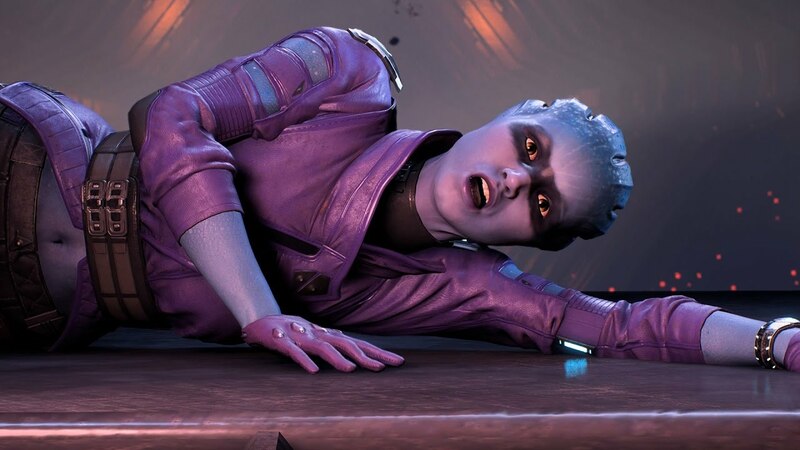 Peebee has found something that she wants to share with you. Speak to Peebee in the Tempest's escape pods. Kesh sent you an email, worried about her grandfather. After much protest, Drack agreed to see Dr. Lexi T'Perro. She's asked you to ensure he makes his appointment. Jaal has asked Ryder to accompany him to Havarl and meet his mother. Nakmor scouts from New Tuchanka have reported kett ships crashed On Elaaden. They believe this is something that warrants a Pathfinder's attention. Moshae Sjefa urges you to speak with the few remaining angara on Aya who remember how the kett conquered their people. The Moshae believes these elders insights can aid the initiative's struggle against the kett. An anonymous message suggests sinister motives behind the capture of the salarian ark. Follow the leads to uncover the truth. When you docked at Nexus, Dr. Lexi T'Perro stepped off the ship. Suvi isn't sure where she went.